For many members of Scouting, the program is something they’ve been a part of since they were as young as Beavers or Cubs. In my case, however, I joined Scouts at the age of 12. My parents had the goal of making sure I had the opportunity to try as many different things as possible so I could grow up as a well-rounded person. When they were kids, my parents were raised on opposite sides of the country during a time when kids were not often enrolled in extracurricular activities. As a result, I now get to do things they wished they had participated in—like playing hockey and taking violin lessons. I became interested in Scouting after reading the history of how the Movement came to be. I knew cousins who were enrolled in Scouting and they told me quite a few fun stories from their camping trips and cool activities they did in meetings—like building Kub Kars. In addition to my cousins’ stories, it was the history of Scouting that captivated me; I learned that Scouting was something that had been around for over a century, and its core values and principles lined up well with my own. Between wanting to join the Scouting adventures I had heard about, and looking for a common activity for me and my friend to share, we chose Scouting. My takeaway from my Scouting years have been the memories I’ve made and the friendships I’ve built. From day one, I realised I had many common interests with my Troop mates, making long treks and camping trips all the more fun because we had so many things to talk about. On one such trek, we were canoeing in Algonquin Park. While contemplating the best place to go filter water, my partner and I looked up to see a pair of moose nonchalantly bathing in the lakeside no more than a few metres away from us. Our surprise and awe led to a great bonding moment, as well as a standout memory. I remained in the Scout age group for one more year after that, concluding that season with the Canadian Jamboree in 2013, the highlight of my time as a Scout. The process of getting to CJ and being there gave me a lot of opportunities to learn about myself and things that I enjoyed, getting to know people in a short period of time, collecting Scouting insignia, and my fascination with large live events. From September all the way until July, CJ had been put on our minds by our Scouters. I wasn’t too bothered by it. I enjoyed learning the logistics and the things we had to learn and keep in mind for embarking on such an adventure. In hindsight, the process of planning, fundraising, and practising for CJ 13’ likely laid the foundation for my intrigue in being part of big events pertaining to my interests. Two years later, I organized a local video game tournament, booking the venue, selling tickets and running the day. Going back to things I learned from CJ, getting to know people quickly is a good asset to have. While chatting with one person in particular, it solidified another interest I have been able to delve into. This person was a Medical Venturer, Medvents as we call them. 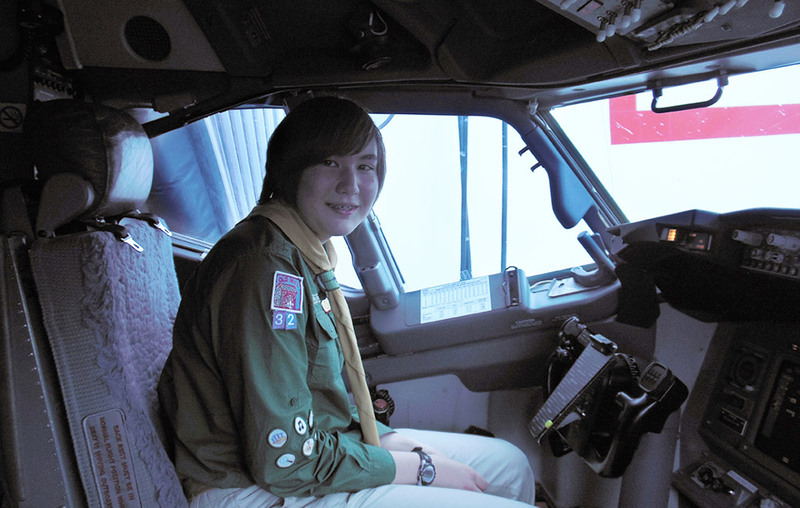 On our bus ride from Camp Woods to Calgary Airport, we met this Medvent, who happily talked with us about the vocational Scouting program, the things he enjoyed about it, and things about himself personally. I got off that bus very interested in becoming a Medvent. I returned to Toronto after CJ as a Venturer Scout. 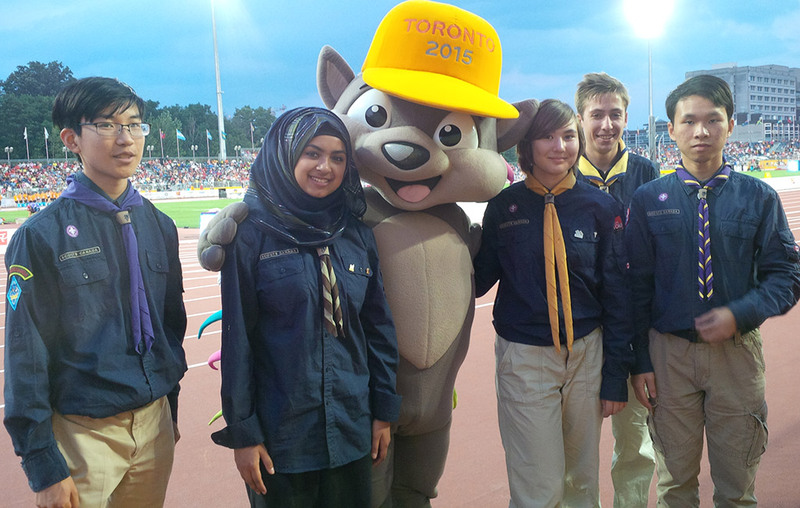 When Toronto later hosted the Pan Am Games in 2015, Scouts Canada was forming a contingent of volunteers for the Games. While I didn’t know it at the time, joining this contingent was feeding my interest in being part of a support team for big events. I participated as a flag bearer, carrying out and raising the flags during medal ceremonies. I got to see the back-end perspective of a large sporting event, meet lots of interesting people, and further solidify my love for representing Scouts Canada. I can say that I was able to raise the Canadian flag for a gold medal with the national anthem playing—certainly not something you get to do every day! As a Venturer I also joined Scouts Canada’s Youth Spokesperson program (YSP). 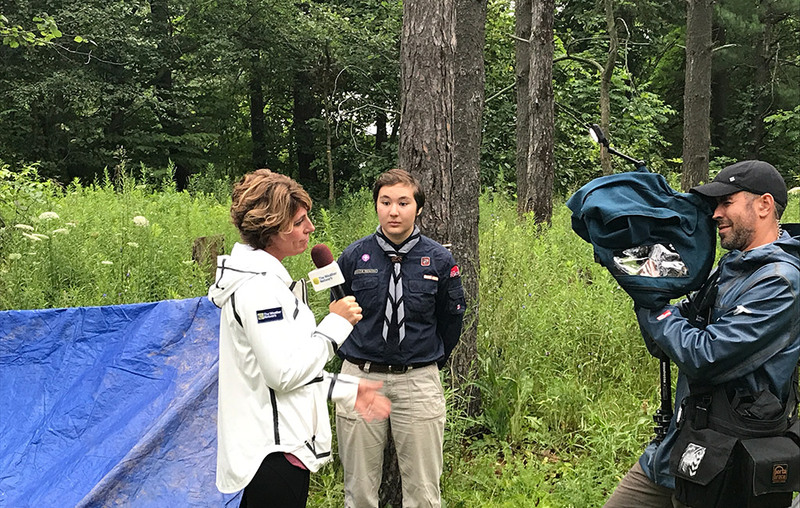 Beyond giving me a platform to share my Scouting stories in publications like Scouting Life, I also get to represent Scouts Canada in the media. I enjoy promoting and talking about things that I love. As a YSP, I’ve ‘come out of my shell’ through things like writing articles—something I don’t consider my forte—and posting on social media. While doing interviews and appearing in front of a camera are things that I already considered to be my strengths, as a YSP I have received training to further augment those skills, and after each interview I can always evaluate myself to improve in the future. Throughout my time as a Venturer Scout and YSP, my interest in becoming a Medvent remained. Last fall, with a number of changes in my life allowing me time to commit, I was finally able to achieve that goal. While the Medvents program is a prime example of the things you can do in Scouting as a Venturer, it also serves as a prime example of how Scouting can carry into adulthood. With the amount of Medical Rovers in the 1st Downsview Crew, I have been able to transition from Venturers to Rovers and bond with many new people on a peer level. As someone in the transition period between secondary and post-secondary, this social group has proven indispensable for me because it can be difficult to find a social circle at this age, especially when you are not enrolled in an academic setting. But most importantly, at every meeting, I am learning new things. Although I joined Scouting as a Scouts, and not younger like others, I’ve done a lot in what feels like a short amount of time. Like every other aspect of my life, there is still much that can be accomplished. My biggest regret? Not joining Scouting sooner. Despite all the adventures I’ve been able to do as an older youth member, I still cannot shake the idea of things I could have accomplished if I had joined as a Beaver or a Cub. Regardless, Scouting is a lifelong adventure that can start anytime, and go anywhere. I am grateful for the memories and opportunities I’ve had thus far in my Scouting adventure, and I am excited to see what the future has in store.